WHERIN IS CONTEINED A CATECHISME FOR CHILDREN. To thende that confirmacion may be ministred to the more edifying of suche as shall receive it (according to Saint Paules doctrine, who teacheth that all thynges should be doen in the churche to the edificacion of the same) it is thought good that none hereafter shall be confirmed, but suche as can say in theyr mother tong, tharticles of the faith the lordes prayer, and the tenne commaundementes; And can also aunswere to suche questions of this shorte Catechisme, as the Busshop (or suche as he shall appoynte) shall by his discrecion appose [=examine] them in. And this ordre is most convenient to be observed for divers consideracions. ¶ First because that whan children come to the yeres of discrecion and have learned what theyr Godfathers and Godmothers promised for them in Baptisme, they may then themselfes with their owne mouth, and with theyr owne consent, openly before the churche ratifie and confesse the same, and also promise that by the grace of God, they will evermore endevour themselves faithfully to observe and kepe such thinges, as they by theyre owne mouth and confession have assented unto. ¶ Secondly, for asmuch as confirmacion is ministred to them that be Baptised, that by imposicion of handes, and praier they may receive strength and defence against all temptacions to sin, and the assautes of the worlde, and the devill: it is most mete to be ministred, when children come to that age, that partly by the frayltie of theyr owne fleshe, partly by the assautes of the world and the devil, they begin to be in daungier to fall into sinne. ¶ Thirdly, for that it is agreeable with the usage of the churche in tymes past, wherby it was ordeined, that Confirmacion should bee ministred to them that were of perfecte age [i. e., an adult], that they beyng instructed in Christes religion, should openly professe theyr owne fayth, and promise to be obedient unto the will of God. 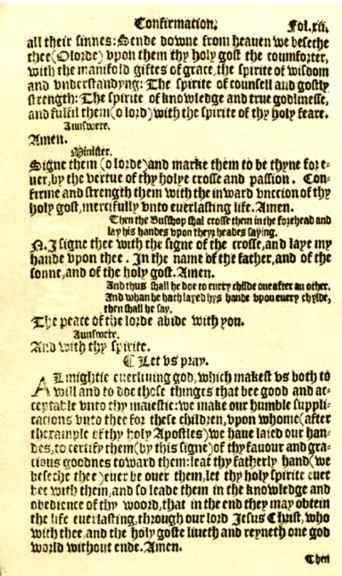 ¶ And that no manne shall thynke that anye detrimente shall come to children by differryng of theyr confirmacion: he shall knowe for trueth, that it is certayn by Goddes woorde, that children beeyng Baptized (if they departe out of thys lyfe in theyr infancie) are undoubtedly saved. BEFORE HE BE BROUGHT TO BE CONFIRMED OF THE BUSHOP. Question. Who gave you this name? Aunswere. My Godfathers and Godmothers in my Baptisme, wherein I was made a member of Christe, the childe of God, and inheritour of the kingdome of heaven. Aunswere. They did promise and vowe three thinges in my name. First, that I should forsake the devil and all his workes and pompes, the vanities of the wicked worlde, and all the sinne full lustes of the fleshe. Secondly, that I should beleve all the articles of the Christian fayth. And thirdly, that I should kepe Goddes holy will and commaundementes and walke in the same al the daies of my life. Question. Dooest thou not thinke that thou arte bound to beleve, and to doe as they have promised for thee? Aunswere. Yes verely. And by Gods helpe so I wil. And I hartily thanke our heavenly father, that he hath called me to thys state of salvacion, through Jesus Christe our Saveour And I pray God to geve me hys grace, that I may continue in the same unto my lives ende. Aunswere. I beleve in God the father almightie, maker of heaven and earth. And in Jesus Christ his only sonne our lord. Whiche was conceived by the holy gost, borne of the virgin Marie. Suffered under Ponce Pilate, was crucified, dead, and buried, he descended into hel. The third day he rose agayn from the dead. He ascended into heaven, and sitteth on the right hande of God the father almightie. From thence shal he come to judge the quicke and the dead. I beleve in the holy goste. The holye catholike church. The communion of saintes. The forgevenes of sinnes. The resurreccion of the bodie. And the lyfe everlasting. Amen. Question. What dooest thou chiefely learne in these articles of thy beliefe? Aunswere. Firste, I learne to beleve in God the father, who hath made me and all the worlde. Secondely, in God the sonne who hath redemed me and all mankinde. Thirdly, in god the holy goste, who sanctifyeth me and all the electe people of god. Question. You sayde that your Godfathers and Godmothers dyd promyse for you that ye should kepe Goddes commaundementes. Tell me how many there bee. Aunswere. Thou shalte have none other Gods but me. II. Thou shalte not make to thyselfe anye graven image, nor the likenesse of any thyng that is in heaven above, or in the earth beneath, nor in the water under the earth: thou shalt not bowe downe to them, nor wurship them. III. Thou shalt not take the name of the lord thy God in vayne. IV. Remember that thou kepe holy the Sabboth day. VI. Thou shalt doe no murdre. VII. Thou shalt not commit adultry. IX. Thou shalt not beare false witnes against thy neighbour. X. Thou shalt not covet thy neighbours wife, nor his servaunt, nor his mayde, nor his Oxe, nor his Asse, nor any thing that is his. Question. What dooest thou chiefely leame by these commaundemente? Question. What is thy duetie towardes god? Aunswere. My duetie towardes God is, to beleve in him. To feare him. And to love him with al my hart, with al my mind, with al my soule, and with all my strength. To wurship him. To geve him thankes. To put my whole truste in hym. To call upon him. To honor his holy name and his word, and to serve him truely all the daies of my life. Question. What is thy dutie towardes thy neighboure? Answere. My duetie towardes my neighbour is, to love hym as myselfe. And to do to al men as I would they should do to me. To love, honour, and succoure my father and mother. To honour and obey the kyng and his ministers. To submitte myselfe to all my governours, teachers, spirituall pastours, and maisters. To ordre myselfe lowlye and reverentelye to al my betters. To hurte no bodie by woorde nor dede. To bee true and just in al my dealing. To beare no malice nor hatred in my heart. To kepe my handes from picking and stealing, and my tongue from evill speaking, liyng, and slaundring. To kepe my bodie in temperaunce, sobreness, and chastitie. Not to covet nor desire other mennes goodes. But learne and laboure truely to geate my owne living, and to doe my duetie in that state of life: unto which it shal please God to cal me. Question. My good sonne, knowe this, that thou arte not hable to do these thinges of thyself, nor to walke in the commaundementes of God and to serve him, without his speciall grace, which thou muste leame at all times to cal for by diligent prayer. Leat me heare therfore if thou canst say the Lordes prayer. Answere. Our father whiche art in heaven, halowed bee thy name. Thy kyngdome come. Thy wil bee done in earth as it is in heaven. Geve us this day our dailye breade. And forgene us our trespasses, as we forgeve them that trespasse againste us. And leade us not into temptacion, but deliver us from evil. Amen. Question. What desireste thou of God in this prayer? Answere. I desire my lord god our heavenly father, who is the gever of al goodnes, to send his grace unto me, and to all people, that we may wurship him, serve hym, and obey him, as we ought to doe. And I praye unto God, that he will sende us al thynges that be nedeful both for our soules and bodies: And that he wil bee mercifull unto us, and forgeve us our sinnes: And that it will please him to save and defende us in al daungers gostly [=spiritually] and bodily: And that he wil kepe us from al sinne and wickednes, and from our gostly enemye, and from everlastyng death. And this I truste he wil doe of his mercie and goodnes, through our lorde Jesu Christe. And therefore I say, Amen. So be it. ¶ So soone as the children can say in their mother tongue tharticles of the faith, the lordes praier, the ten commaundementes, and also can aunswere to such questions of this short Cathechisme as the Bushop (or suche as he shall appointe) shal by hys discrecion appose them in: then shall they bee brought to the Bushop by one that shalbee his godfather or godmother, that everye childe maye have a wittenesse of hys confirmacion. ¶ And the Bushop shal confirme them on this wyse. Our helpe is in the name of the Lorde. Answere. Whiche hath made both heaven and yearth. Minister. Blessed is the name of the lorde. Answere. Henceforth worlde without ende. Minister. The lorde be with you. ALMIGHTY and everliving God, who hast vouchesafed to regenerate these thy servauntes of water and the holy goste: And haste geven unto them forgevenesse of all their sinnes: Sende downe from heaven we beseche thee, (O lorde) upon them thy holy gost the coumforter, with the manifold giftes of grace, the spirite of wisdom and understandyng; the spirite of counsell and gostly strength; The spirite of knowledge and true godlinesse, and fulfil them, (o lord) with the spirite of thy holy feare. Minister. Signe them (o lorde) and marke them to be thyne for ever, by the vertue of thy holye crosse and passion. Confirme and strength them with the inward unccion of thy holy gost, mercifully unto everlasting life. Amen. 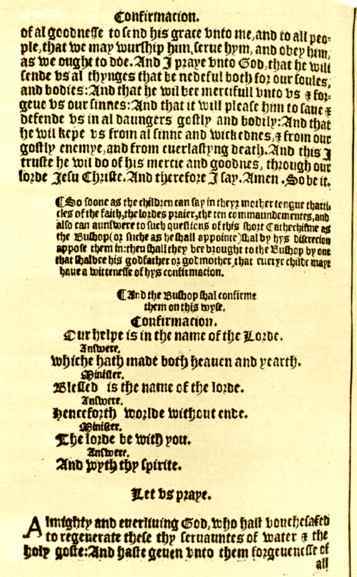 Two pages from the Confirmation service, 1549 BCP. N. I signe thee with the signe of the crosse, and laye my hande upon thee. In the name of the father, and of the sonne, and of the holy gost. Amen. And thus shall he doe to every childe one after another. And whan he hath layed hys hande upon every chylde, then shall he say. The peace of the lorde abide with you. ALMIGHTIE everliving god, which makest us both to will and to doe those thinges that bee good and acceptable unto thy majestie: we make our humble supplicacions unto thee for these children, upon whome (after thexample of thy holy apostles) we have laied our handes, to certify them (by this signe) of thy favour and gracious goodnes toward them: leat thy fatherly hand (we beseche thee) ever be over them, let thy holy spirite ever bee with them, and so leade them in the knowledge and obedience of thy woord, that in the end they may obtein the life everlasting, through our lord Jesus Christ, who with thee and the holy goste liveth and reyneth one god world without ende. Amen. Then shall the Busshop blisse the children, thus saying. The blissing of god almightie, the father, the sonne, and the holy goste, be upon you, and remayne with you fore ever. Amen. The curate of every parish once in sixe wekes at the least upon warnyng by him geven, shal upon some Soonday or holy day, half an houre before evensong openly in the churche instructe and examine so many children of his parish sent unto him, as the time wil serve, and as he shal thinke conveniente, in some parte of this Cathechisme. And all fathers, mothers, maisters, and dames, shall cause theyr children, servountes, and prentises (whiche are not yet confirmed), to come to the churche at the daie appoynted, and obediently heare and be ordered by the curate, until suche time as they have learned all that is here appointed for them to learne. ¶ And whansoever the Bushop shal geve knowlage for children to be brought afore him to any convenient place, for their confirmacion: Then shal the curate of every parish either bring or send in writing, ye names of al those children of his parish which can say tharticles of theyr faith, the lordes praier, and the ten commaundementes. And also how many of them can answere to thother questions conteined in this Cathechisme. ¶ And there shal none be admitted to the holye communion: until suche time as he be confirmed.